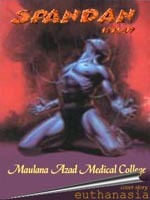 Spandan is the annual magazine of the Maulana Azad Medical College. Released every year in April, Spandan marks the culmination of all the activities of the EdB. It is the official magazine of MAMC. Hence it departs greatly from the casual attitude of the other publications and projects a professional image while maintaining the distinctive MAMC flavor in its articles. Here at Spandan.com you can find the best articles from Spandan, hand-picked by the editors. Also included is the complete cover story on Euthanasia from Spandan '97. The Spandan articles are written by the MAMC students and faculty. And every year the EdB selects a central story for the magazine, for which it conducts in-depth research, surveys, etc to present a comprehensive evaluation of the issue. Spandan 97, for instance, covered the controversial topic of Euthanasia in India. Here are archived some of the best articles to appear in Spandan, hand-picked by the editors. Click on the article name to view the complete text.